Christie's New York Important Watches sale will be held on 17 June 2015 and will boast a 265-lot selection of both vintage and modern timepieces. Without being the top lots of the sale, the two lots that we highlight here are certainly very interesting. Originally described in a 1960s Patek Philippe marketing pamphlet as the Rhomboid, lot 58 is a rare pink gold asymmetrical wristwatch ref. 3422 manufactured in 1962 and powered by a Calibre 99 P mechanical lever movement. It was considered ahead of its time and quite difficult to sell at first. As a consequence, very few were made and it is believed that fewer than 4 were made in rose gold of this reference. The champagne gold dial features raised enamel lines to mark the hours. The overal length is 33 mm. Designed by Geneva jewelry designer Gilbert Albert, today these asymmetrical models are highly sought after for their rarity and futuristic design. The estimate for lot 58 is US$ 40,000 – $60,000. Lot 154 is an extremely rare oversized Panerai diver's wristwatch manufactured in 1956 for the Egyptian Navy. Nicknamed the Egiziano (Italian for Egyptian), this model is the largest of all Panerai wristwatches ever made: the tonneau-shaped stainless steel case has an impressive diameter of 58 mm! It features a revolving bezel graduated for 5 minutes, the inclusion at the specific request of the Egyptian navy, and the signature crown protection device. The dial - with Radiomir written under 12 o'clock and Panerai above 6 o'clock - consists of two discs, the lower one coated with luminous substance visible through the cut out Arabic and baton numerals in the black matte upper disc. The wristwatch is powered by an Angelus movement with a power reserve of 8 days. No documentation survived in regards to the precise number of Egiziano produced. Experts tend to agree that no more than 50 watches were supplied to the Egyptian Forces and that few other examples were made as prototypes. The estimate is US$ 150,000 – $250,000. Christie's New York Important Watches sale will be held on 17 June 2015 and will boast a 265-lot selection of both vintage and modern timepieces. 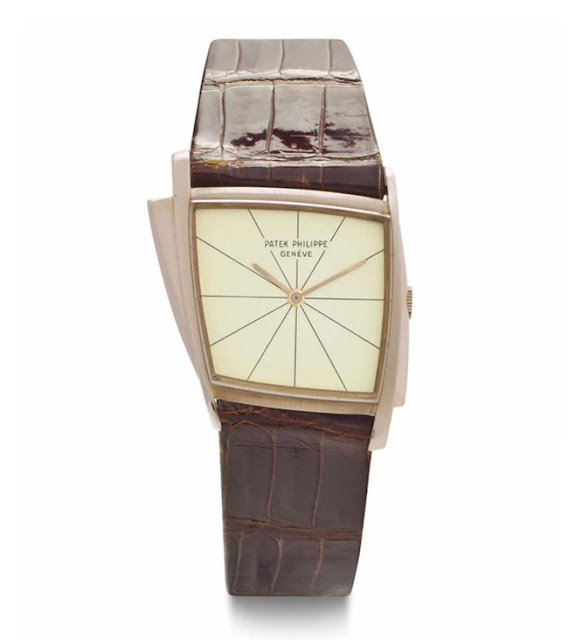 Originally described in a 1960s Patek Philippe marketing pamphlet as the Rhomboid, lot 58 is a rare pink gold asymmetrical wristwatch reference 3422 designed by Geneva jewelry designer Gilbert Albert. 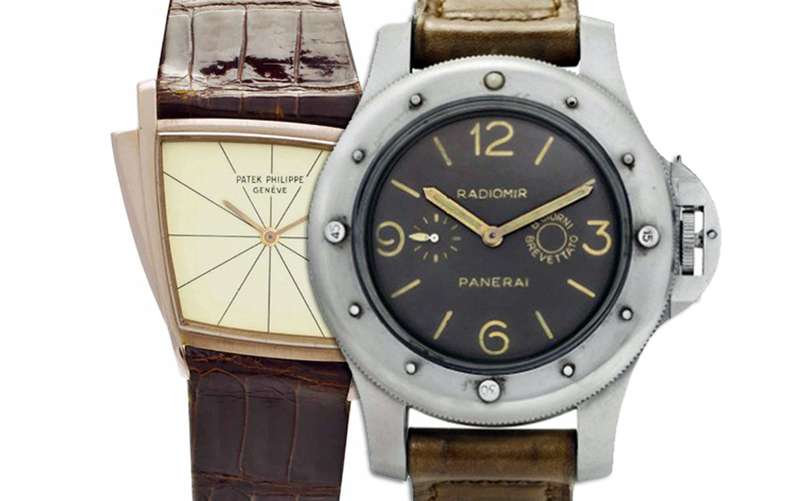 Lot 154 is an extremely rare oversized Panerai diver's wristwatch manufactured in 1956 for the Egyptian Navy. 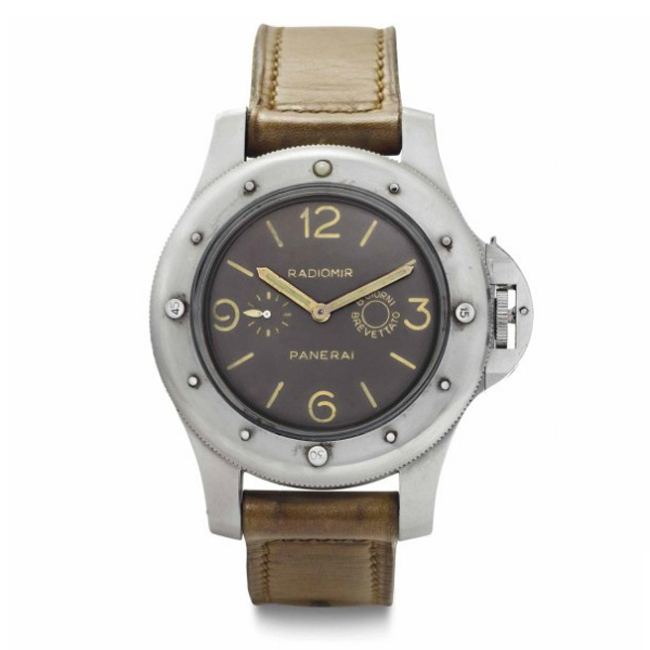 Nicknamed the Egiziano (Italian for Egyptian) this model is the largest of all Panerai wristwatches ever made with a diameter of 58 mm!